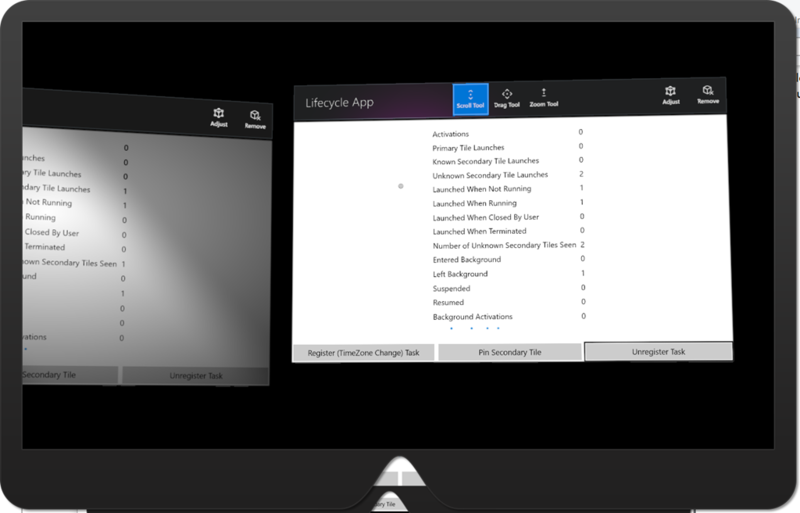 because I think there are some new things in running apps on the HoloLens that regular 2D UWP app developers (including me!) would want to dig into. is a useful tool to use here (I’m sure there are others!) 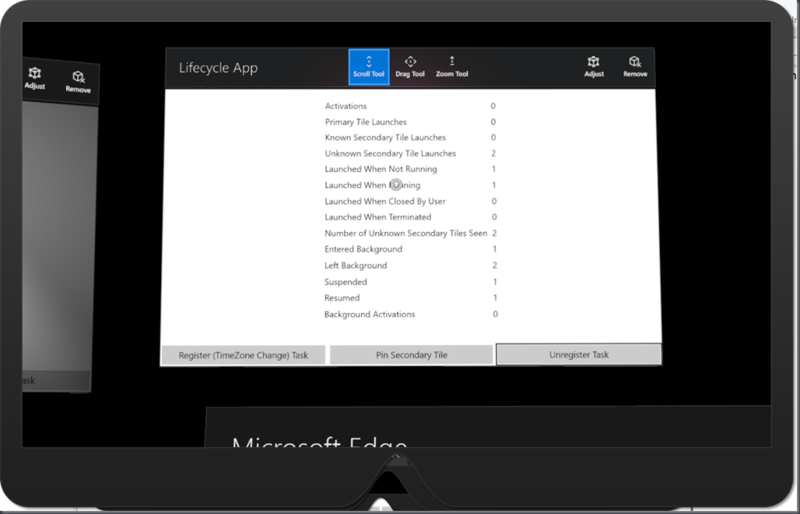 as I think it can be used to show how apps running on HoloLens have the same lifecycle as all UWP apps but the path through that lifecycle varies slightly. The official docs explain it all but I really needed to see it for myself to understand it better and this post is just a write-up of my experiments (i.e. it could be wrong, I do my best but I’m rarely 100% accurate ) in case they help others to reason over the same thing. 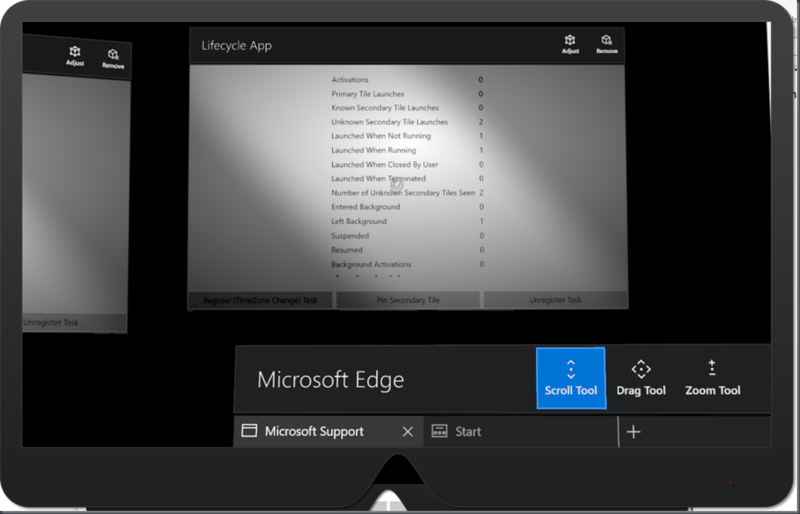 If I take the app that I wrote in that post and I run it on my PC after a clean installation then what happens is this. 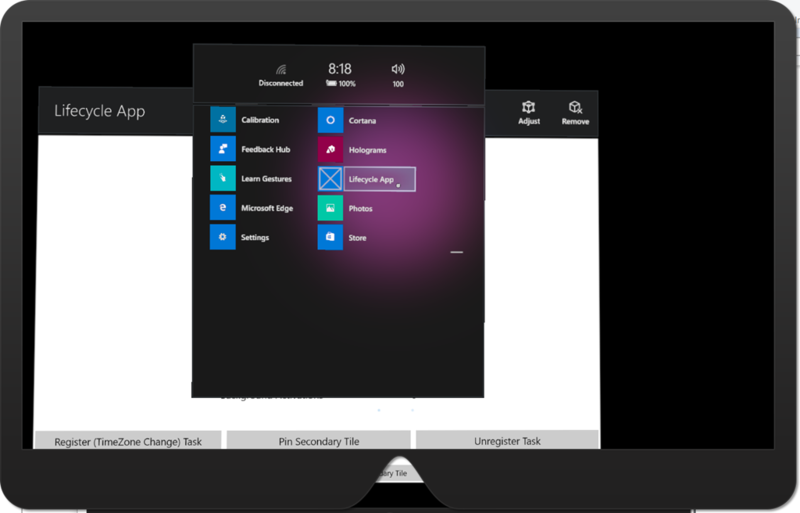 I launch the app from its tile on the start menu. 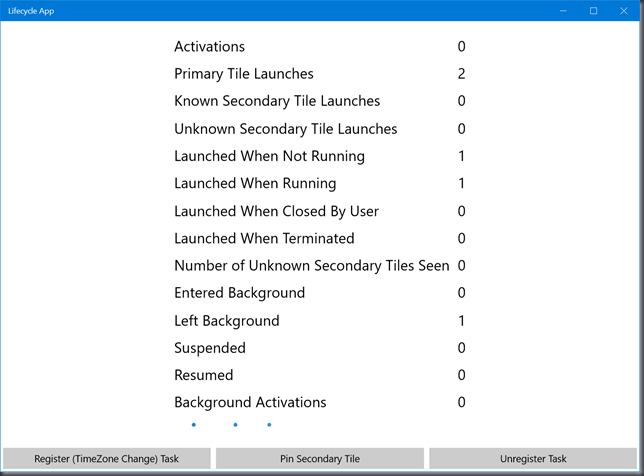 This is what I’d expect – the app has launched from its primary tile (the tile id will be “App”) and it runs straight away and it goes through the ‘leaving background’ stage and it wasn’t already running and so the app records that these 3 things have happened. No great surprises there either – the app has now been launched twice from its primary tile and in one case it wasn’t already running and in the other it was. and hopefully the output makes sense – the app has been launched from a secondary tile that it recognises and it was already running and so that it what I’d expect. Beyond that, the app goes through its lifecycle that I’m used to – it goes into/out-of the background state, it suspends/resumes and sometimes it terminates. Every app starts by placing an app tile (just a Windows secondary tile https://msdn.microsoft.com/en-us/library/windows/apps/windows.ui.startscreen.secondarytile.aspx) in the HoloLens shell. 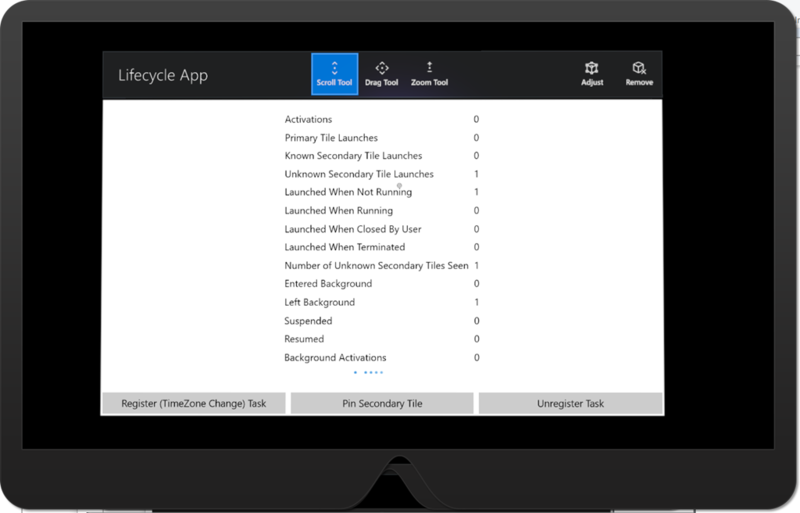 These app tiles, on placement, will start running the app. These app tiles persist and stay at the location where they are placed, acting like launchers for anytime you want to get back to the app. This is interesting to me. 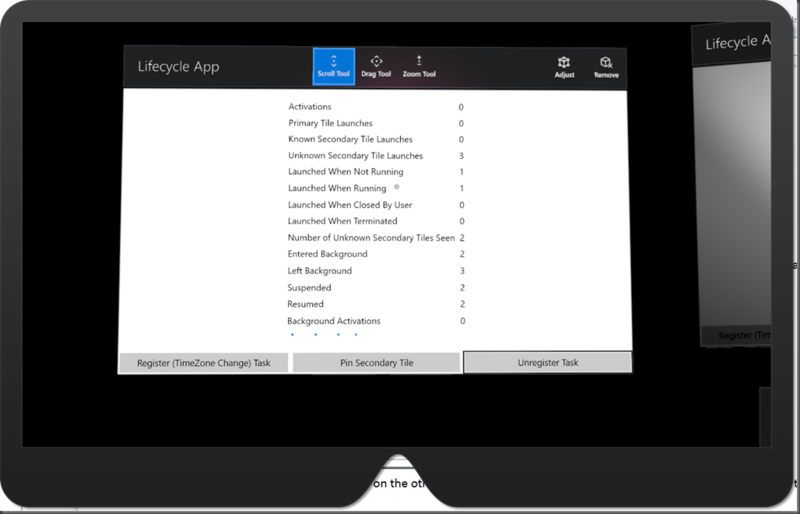 It’s exactly as the documentation says – the app has not been launched from a primary tile or a secondary tile that the app knows about. 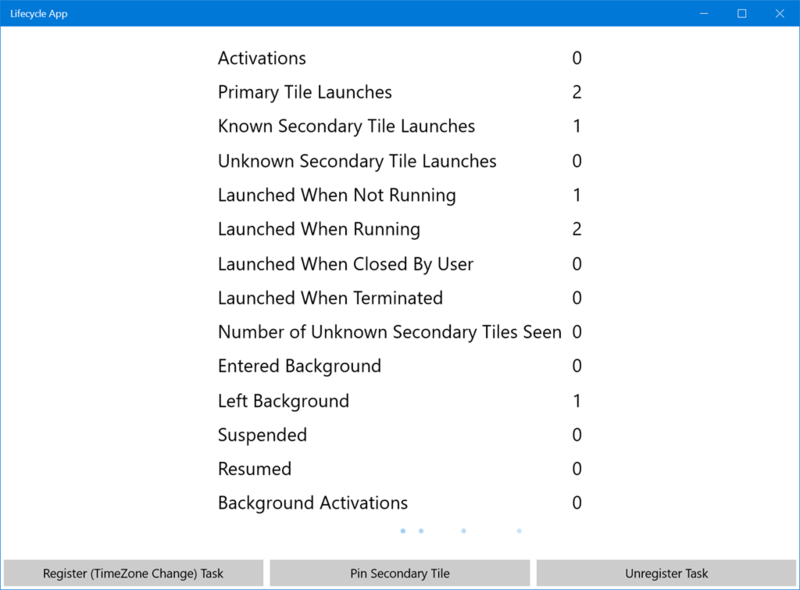 It has instead been launched by a secondary tile that the system has created (from debugging, it seems to give them a GUID based identifier). The system is going to create these for each ‘placement’ of the app that the user requests and the system is going to remember them. Run my app, place it in room 1. Run my app. I’d be disappointed if the device said “it’s already running, you need to go to room 1” and especially given that room 1 might be in another building in another location so the system doesn’t do that, it lets me run my app and place it in room 2. Enter room 1 where my app is still placed in that environment and ready for me to use one again, kind of like magic. So the system is creating these GUIDs that represent where my app has been placed and it’s remembering them for me. My app could presumably count them up by asking the system to find all of its secondary tiles but I don’t have that code in my app just yet. 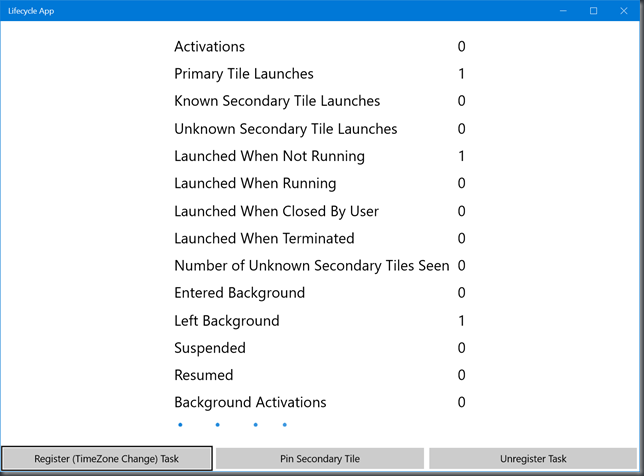 The code I do have, ‘remembers’ every unique tile ID that it has been launched with which aren’t already known to it (it knows two – “App” and “App2”) under the count labelled “Number of Unknown Secondary Tiles Seen” and this is a value of 1 on the UI in the screenshot above because the app has been launched from a tile created by the system. and this can be seen in the ‘window’ on the left which has gone to sleep and been replaced by a bitmap although it’s worth saying that this is from the same app rather than another app and it’s also worth saying that the app has not suspended here as the window on the right indicates but it has had its output replaced by a now slightly out of date bitmap. 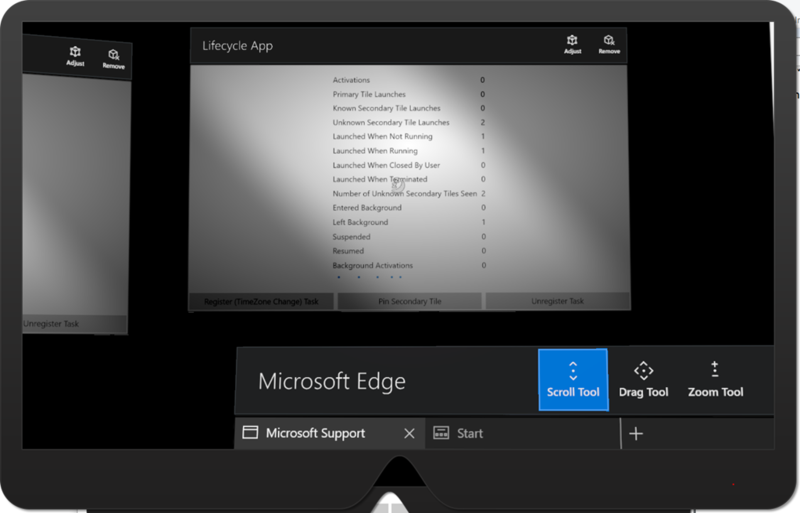 I’m now in a situation which I don’t think I could get into on another Windows 10 device in exactly the same way which is that the same app has ‘launched’ into two windows on the screen coming from the same process. Note – it’s perfectly possible for a UWP app on another Windows 10 device (e.g. 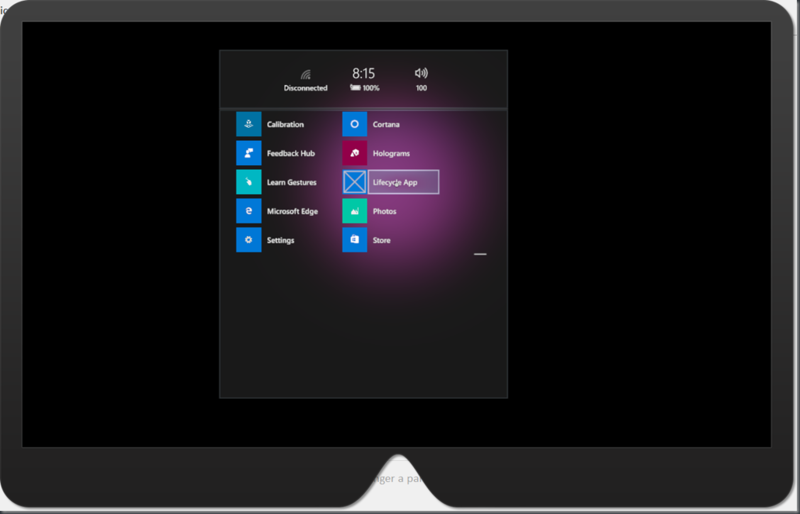 PC) to open up multiple windows and then to display different UI in them but it doesn’t happen in quite the same way as here – i.e. the system doing multiple launches with unique secondary tile IDs. 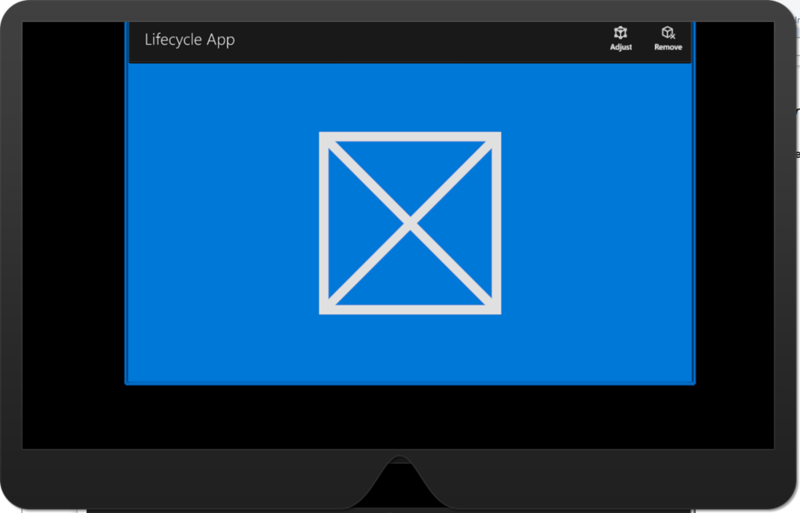 I’ve written a little about multiple windows in the past. If I then move away from my app once again and tap around on the other apps in order then at some point my app goes back to sleep. so the app has entered the background again, been suspended, been resumed and then it has also been launched again from from a secondary tile that the system owns. So, I think I’m starting to “get it” but I’d like to think on it a little more from the point of view of ‘state management’. From my experiments so far (in the debugger) it would seem that each of the ‘placed’ app instances ends up with the same instance of a Window and so a developer who’d used something like the default ‘blank UWP app’ templates in Visual Studio would be on familiar ground in that when there were N ‘placements’ of their app in the mixed reality world there would only be 1 Window, 1 Frame and 1 ‘MainPage’ to worry about (and one navigation stack) although I’d like to dig in a little more to figure out what that really looks like.